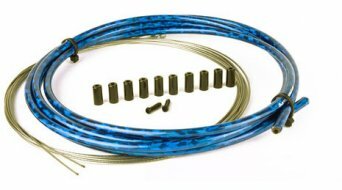 Buy brake cables & derailleur cables for mountain bikes and road bikes, outer casings, end caps and accessories online at favourable prices and from a large selection. Brake cables consist of a 1.6 mm thick steel or stainless steel rope with a ton shaped or pear-shaped end which serves as thrust bearing in the brake lever. The difference between road bike and MTB cables is easily recognizable: Road bike brake handles need the "pear-shaped", MTB/touring brake handles only the "ton-shaped" end piece. It should be possible to move the brake cable within the cable sleeve with as low a friction as possible. The cables are therefore encased in plastic and/or coated with plastic. This Teflon coating is also named PTFE. Same as the brake cables, the derailleur cables consist of steel/stainless steel, but with a diameter of 1.2 mm and a small cylindrical end which suits most of the gearing systems. Only Campagnolo makes an exception and has special end pieces. They also have the coating with PTFE and/or Teflon. Exterior sleeves are available in many colours for brake as well as for derailleur cables so that almost any colour concept can be realised. Of course, the cable is supposed to move friction-free, that is why the cable sleeves are also teflon or PTFE-coated on the inside. We offer cables by the metre or also ready-made in a set. The average length is mostly indicated with 2 m, but there are also special cables with extra lengths, e.g. for tandem bikes. In order for everything to also work well at rain and snow conditions, there are various waterproof sleeves, wire end ferrules or cable guides and many more.